Melody Vallieu | AIM Media Midwest Whitley Slaton, 12, of Tipp City and a member of the Lucky Horse Shoes 4-H Club, won first place 3-Gait Novice with her horse Johnny. She is the daughter of Maria and Mark Fox and Bobby Slaton. Melody Vallieu | AIM Media Midwest Brent Hartzell of Houston and a member of the Covington Mounties 4-H Club won 9-13 year old Reserve Champion Horseemanship. He is the son of Brandon and Katie Hartzell. Melody Vallieu | AIM Media Midwest Adelynn Rich of Covington and a member of the Boots and Saddles 4-H Club, won 9-12 year old Champion Horsemanship with her horse Dee. She is the a member of Robert and Mary Beth Rich. 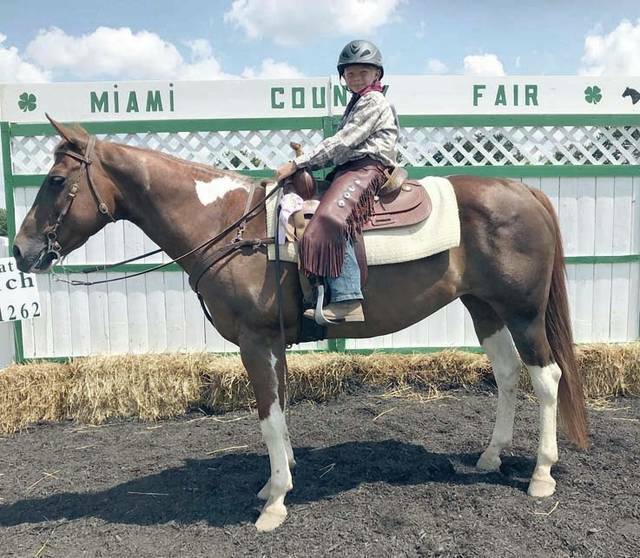 Melody Vallieu | AIM Media Midwest Bailey Supinger, 13, of Covington and a member of Mane Express 4-H Club, won Reserve Champion Poles wither her horse Harley. She is the daughter of Wendy and Garry Gump. Melody Vallieu | AIM Media Midwest Haylie Jackson, 15, of Covington and the Mane Express 4-H Club, won first place in the 14-18 Pole Bending. She is the daughter of Doug and Lacey Apple and Andrew Jackson. Melody Vallieu | AIM Media Midwest Emma Fowler of Tipp City and a member of the Mane Express 4-H Club won first place Stakes Race with her horse Tika. She is the daughter of Vicki Heywood and James Fowler. Melody Vallieu | AIM Media Midwest Faith Pike, 15, of Bethel Township, Miami County, and a member of the Ride On 4-H Club, won first place in the Easy Gaited Western Horsemanship 14-18 and Grand Champion Easy Gaited Horsemanship 14-18. She is the daughter of Jamie and Stefanie Pike. 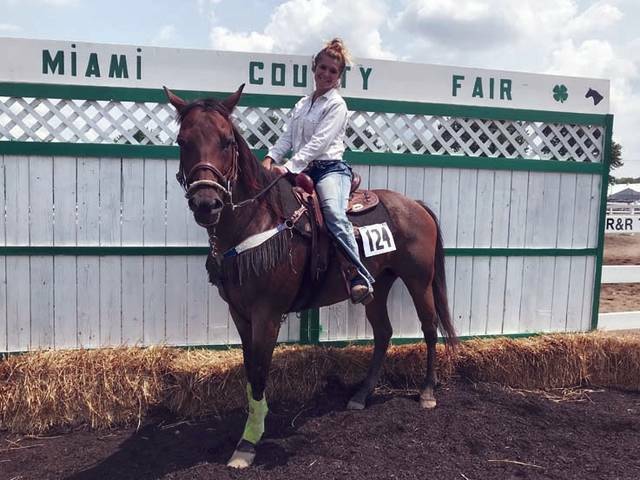 Melody Vallieu | AIM Media Midwest Faith Pike, 15, of Bethel Township, Miami County, and a member of the Ride On 4-H Club, won first place Ranch Pleasure 14-18 and Grand Champion Ranch Pleasure 14-18. She is the daughter of Jamie and Stefanie Pike. Whitley Slaton, 12, of Tipp City and a member of the Lucky Horse Shoes 4-H Club, won first place 3-Gait Novice with her horse Johnny. She is the daughter of Maria and Mark Fox and Bobby Slaton. Brent Hartzell of Houston and a member of the Covington Mounties 4-H Club won 9-13 year old Reserve Champion Horseemanship. He is the son of Brandon and Katie Hartzell. Adelynn Rich of Covington and a member of the Boots and Saddles 4-H Club, won 9-12 year old Champion Horsemanship with her horse Dee. She is the a member of Robert and Mary Beth Rich. Bailey Supinger, 13, of Covington and a member of Mane Express 4-H Club, won Reserve Champion Poles wither her horse Harley. She is the daughter of Wendy and Garry Gump. Haylie Jackson, 15, of Covington and the Mane Express 4-H Club, won first place in the 14-18 Pole Bending. She is the daughter of Doug and Lacey Apple and Andrew Jackson. Emma Fowler of Tipp City and a member of the Mane Express 4-H Club won first place Stakes Race with her horse Tika. She is the daughter of Vicki Heywood and James Fowler. Faith Pike, 15, of Bethel Township, Miami County, and a member of the Ride On 4-H Club, won first place in the Easy Gaited Western Horsemanship 14-18 and Grand Champion Easy Gaited Horsemanship 14-18. She is the daughter of Jamie and Stefanie Pike. 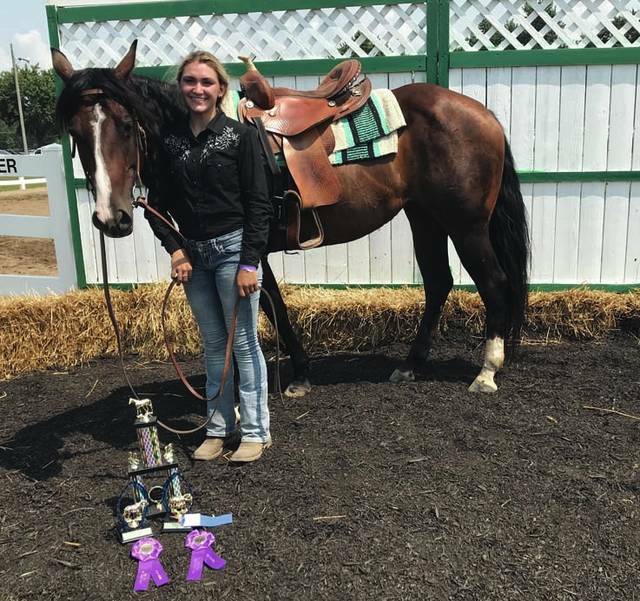 Faith Pike, 15, of Bethel Township, Miami County, and a member of the Ride On 4-H Club, won first place Ranch Pleasure 14-18 and Grand Champion Ranch Pleasure 14-18. She is the daughter of Jamie and Stefanie Pike. https://www.tdn-net.com/wp-content/uploads/sites/21/2018/08/web1_Slaton.jpgMelody Vallieu | AIM Media Midwest Whitley Slaton, 12, of Tipp City and a member of the Lucky Horse Shoes 4-H Club, won first place 3-Gait Novice with her horse Johnny. She is the daughter of Maria and Mark Fox and Bobby Slaton. https://www.tdn-net.com/wp-content/uploads/sites/21/2018/08/web1_Hartzell.jpgMelody Vallieu | AIM Media Midwest Brent Hartzell of Houston and a member of the Covington Mounties 4-H Club won 9-13 year old Reserve Champion Horseemanship. He is the son of Brandon and Katie Hartzell. https://www.tdn-net.com/wp-content/uploads/sites/21/2018/08/web1_Rich.jpgMelody Vallieu | AIM Media Midwest Adelynn Rich of Covington and a member of the Boots and Saddles 4-H Club, won 9-12 year old Champion Horsemanship with her horse Dee. She is the a member of Robert and Mary Beth Rich. 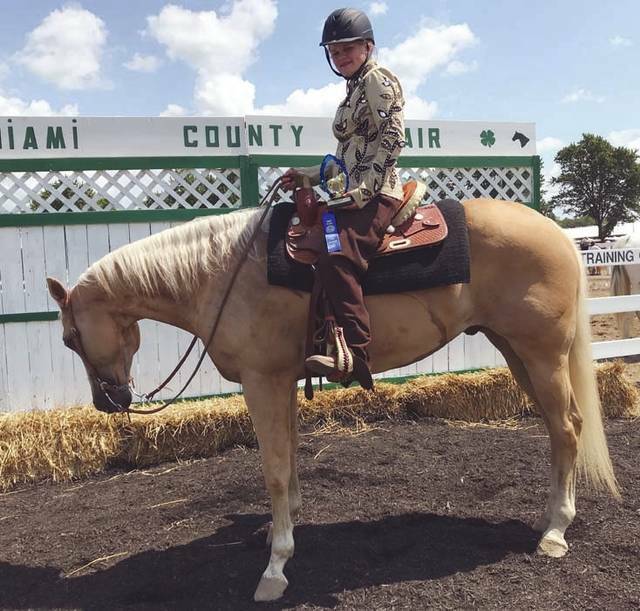 https://www.tdn-net.com/wp-content/uploads/sites/21/2018/08/web1_Supinger.jpgMelody Vallieu | AIM Media Midwest Bailey Supinger, 13, of Covington and a member of Mane Express 4-H Club, won Reserve Champion Poles wither her horse Harley. She is the daughter of Wendy and Garry Gump. 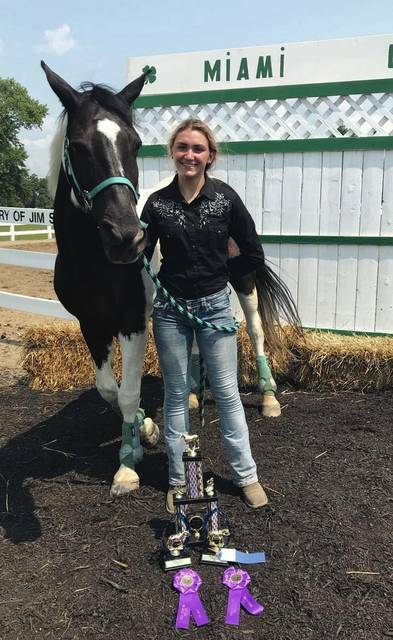 https://www.tdn-net.com/wp-content/uploads/sites/21/2018/08/web1_Jackson.jpgMelody Vallieu | AIM Media Midwest Haylie Jackson, 15, of Covington and the Mane Express 4-H Club, won first place in the 14-18 Pole Bending. She is the daughter of Doug and Lacey Apple and Andrew Jackson. 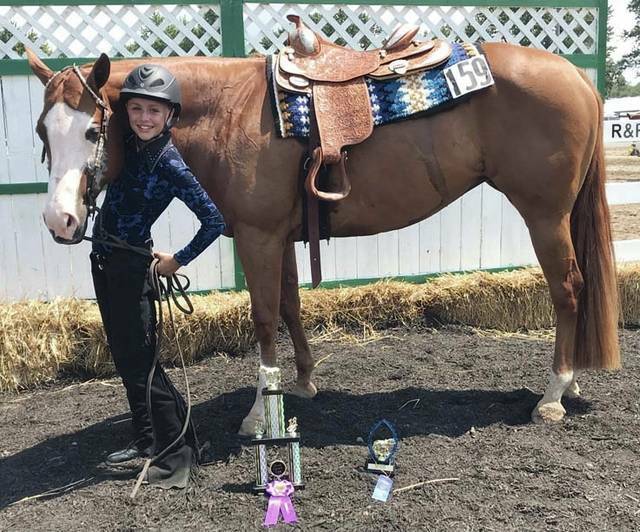 https://www.tdn-net.com/wp-content/uploads/sites/21/2018/08/web1_Fowler.jpgMelody Vallieu | AIM Media Midwest Emma Fowler of Tipp City and a member of the Mane Express 4-H Club won first place Stakes Race with her horse Tika. She is the daughter of Vicki Heywood and James Fowler. 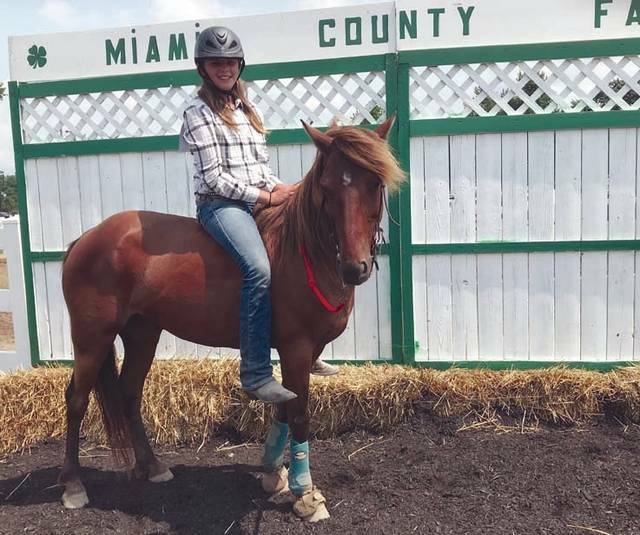 https://www.tdn-net.com/wp-content/uploads/sites/21/2018/08/web1_Pike1.jpgMelody Vallieu | AIM Media Midwest Faith Pike, 15, of Bethel Township, Miami County, and a member of the Ride On 4-H Club, won first place in the Easy Gaited Western Horsemanship 14-18 and Grand Champion Easy Gaited Horsemanship 14-18. She is the daughter of Jamie and Stefanie Pike. 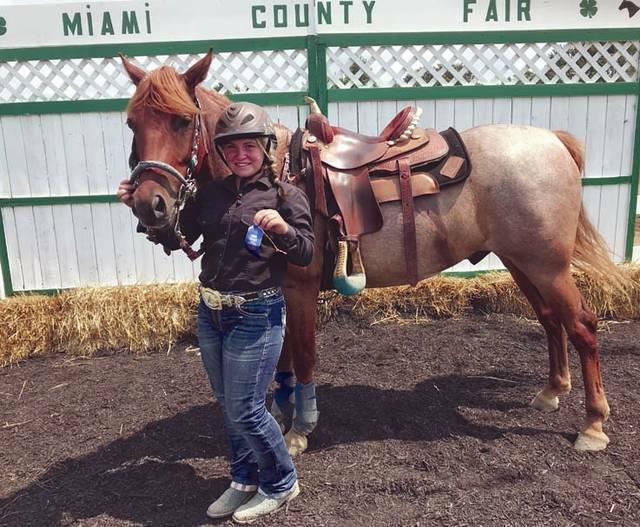 https://www.tdn-net.com/wp-content/uploads/sites/21/2018/08/web1_PIke2.jpgMelody Vallieu | AIM Media Midwest Faith Pike, 15, of Bethel Township, Miami County, and a member of the Ride On 4-H Club, won first place Ranch Pleasure 14-18 and Grand Champion Ranch Pleasure 14-18. She is the daughter of Jamie and Stefanie Pike.